The primary rocket motor thrust stand is located outside of the metropolitan Dade County area in southern Florida and meets or exceeds all distance requirements for safe operation. 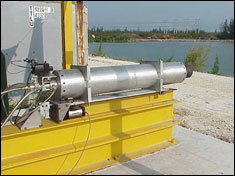 The test stand is capable of testing motors up to 50,000 pounds thrust, with a one-ton maximum motor weight capacity. An armor plated control room allows safe conduct and observation of live motor firings. An integral overhead crane makes test article installation simple and safe. 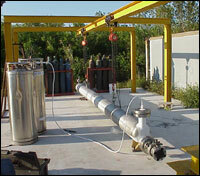 A high-pressure oxidizer tank allows for the use of self pressurizing oxidizers and pressure fed cryogenics. A central fire suppression system is remotely controlled for pre-fire wet downs, water cooled nozzles, fixed deluge systems, and an emergency hand line. All test facilities have fully computerized data acquisition and control systems. High speed remote data acquisition at up to 250 kHz allows for detailed analysis of up to 10 channels with real-time chart plotter. Signal conditioning and amplification transfer the signal into the bunker for safe remote operation. Typical measurements include thrust pressures, temperatures, strain, flow, acceleration and voltage.